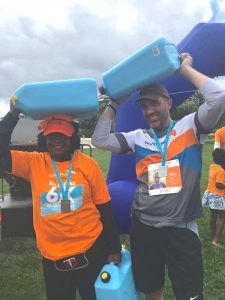 CHICAGO, IL (May 22, 2018) – This past weekend or in recent weeks more than 4,000 Covenanters ran the Global 6K to support Covenant Kids Congo powered by World Vision. Some 80 teams raised more than $332,000 to benefit the development project in the Ledia neighborhood of Gemena, DR Congo. More than 41,000 people now have access to clean water, thanks to two new wells and capped springs. Some who had to walk miles roundtrip can now reach clean water within yards. Runners around the world and of all ages participated. When 19-year-old Erik Wall heard that the run would be on his birthday, he immediately declared that he wanted the run to be his party. 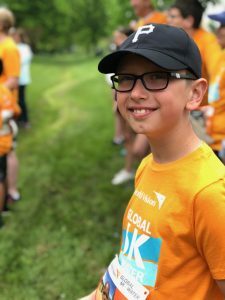 “Erik is completely dumbfounded that kids across the world don’t have clean water and he wants to do something about it,” said his mother, Melissa Wall, pastor of Deer Grove Covenant Church in Palatine, Illinois. Pete Ekstrand, a Covenant missionary to Congo, posted a video of himself finishing the run in the African nation. The project is an unprecedented partnership of the ECC, World Vision US, World Vision Congo, and the Congo Covenant Church to direct millions of dollars to Gemena. It was launched in 2012. In the years since, more than 10,000 children have been sponsored through the holistic program that focuses on water, health and hygiene, food and agriculture, education and literacy, and sustainable economic development.